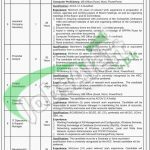 Here on 20th of June, you will be having the latest job offer from Public Sector Organization Karachi Jobs 2017 NTS Online Form Download. Applications are being invited from Public Sector Organization of Karachi is seeking to hire the well disciplined, caliber and adroit applicants are required to apply for the following posts which are named as (Value Chain Specialist (Agriculture, Horticulture), Assistant Company Secretary, Financial Analyst, Project Coordinator, Accounts Executive, IT Operations & Support Manager, Receptionist/Secretary, Driver and Office Boy) are the posts which need to be filled by the applicants with overall qualification of Masters, BCS/BS/MCS/B.E, ACCA/CA from well-recognized university and relevant expertise and skills are needed to hold such posts. Age limits are different for each post as 30, 35, 40 and 45 years. Attractive salary package will be given to the applicants with a brilliant atmosphere. Now, I will let you know about its further details below. Applications along with deposit slip can be downloaded from the NTS Site as www.nts.org.pk. Applicants have to pay the Test fee in UBL, HBL & MCB Bank online branches. Duly filled application form with paid deposit slip should reach at the said address. The last date for applying is 2nd July 2017. By hand submitted application will not be entertained. So, for more jobs stay tuned with this job page and get more and more exciting jobs every day.